No, this post (Thomas Edison and the Dragon's Blood) is not the newest installment of Harry Potter. 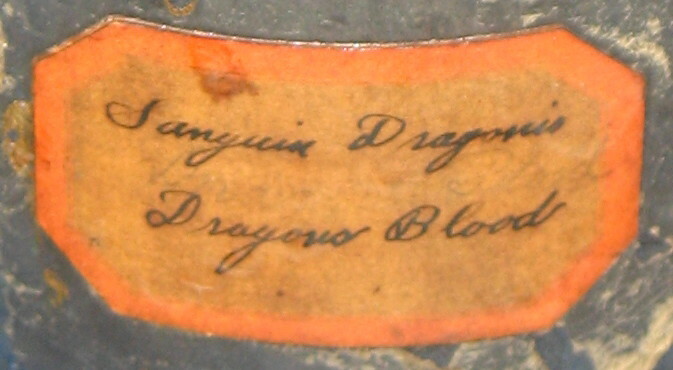 As I promised in my previous post, I have tirelessly researched the question that was raised (by me) during my recent visit to Thomas Edison's laboratories - why the heck did Edison have a bottle of Dragon's Blood in his chemistry lab? I emailed the National Park Service, and was pleasantly surprised to receive a reply. As I noted in my prior post, our tour guide was less than forthcoming about this odd possession of our country's most prolific inventor. I was prepared to file a Freedom of Information Act request to find out what the Park Service was hiding. Happily I did not need to play hard ball. Karen Sloat-Olsen, Chief of Interpretation and Education at Edison's labs, was kind enough to pose my question to the lab's Archivist, Sound Recording Curator and Collection Manager. The Archivist reported that he had not run across any references to Dragon's Blood in Edison's lab notebooks. That was not encouraging, because Edison was known to keep very detailed notebooks. She then checked with the Sound Recording Curator to see if there had been any reference to Dragon's Blood in the production of Edison's phonograph records, as Dragon's Blood can be used to make a resin. No luck there either. Next, she turned to the Collection Manager. The Collection Manager checked to see if Edison had Dragon's Blood on his desk, since another use for the plant is for stomach ailments. Edison did have Listerine and some Soda Mint pills for his stomach, but no Dragon's Blood. I found this almost as interesting as the Dragon's Blood question - the fact that our government has a record of the contents of Edison's desk the day he passed away. Better be careful what you keep on your desk! The Listerine is noteworthy - Edison was known to take short catnaps throughout the day, rather than sleeping for a full 8 hours at night. He would probably take a swig of the Listerine to get rid of that morning breath after waking up. And in case you were wondering, Soda Mint is a common name for sodium bicarbonate, the active ingredient in Alka-Seltzer and similar antacids. Finally, the Collection Manager came through, by locating a reference to Dragon's Blood Gum in the Pattern Shop. The Pattern Shop is essentially a woodworking shop, which was used for making patterns for shaping sheet metal as well as prototype wood cases for Edison's phonographs. Since Dragon's Blood can be used to make varnish and wood stain, it makes sense it would be found in a wood shop (although why someone moved it to the chemistry lab is still a mystery). Believe it or not, this is one of the reasons I had suggested in my prior post for why Edison might have the Dragon's Blood. Boy, I love this stuff! I should have been a curator! To end your year, here are a couple of photos of Edison's Pattern Shop. Have a great 2011! It just goes to show you, eh? The next burning question is: why is the plant named Dragon's Blood in the first place? And who named it that? Good questions, Ellen! Unfortunately I think the answers are lost in antiquity. According to Wikipedia, Dragon's Blood has been mentioned in reference books as far back as the first century AD. Wikipedia also reports that "there appears to have been a tendency to call anything that was bright red 'dragon's blood'", making it even harder to determine who might have been the first to use this name for the red resin from one of several species of plants. Another good question is - why not "ogre's blood" or "troll's blood"? Type can be described as space from amazing appeal for a number of families. replica chanel At present, a lot of women commonly are not truly the only products who understand this unique particular field, for the reason that individuals need launched finding out significant services to boot. chanel replica There is not any purpose through hidden right behind typically the rose bush. Out of all the type items that are present at the specialized economy, trainers not to mention purses might possibly be the services that might be given the task of a number of obsessions. hublot replica uk For the reason that you also have desired, using a particular obsession methods having to pay fundamental amounts from profit. For many, this unique will never work for a situation, like they will be able to compensate large deals for the purpose of purses and / or trainers. fake prada But, not only on anybody inputs this unique section. There can be families, certainly a lot of women, what individuals absolutely adore purses, and yet simply cannot afford to pay to find these products. chanel replica sale Subsequently, through this specified position, what’s furthermore there for you to do? How must a lot of women afford to pay amazing researching purses? Most certainly the remedy is straightforward it will not perhaps even astound most people, bearing in mind that it can be this widely used rehearse. Most females need launched investing in reproduction purses. Concerning further researching concerning handbag, it's revealed that going barefoot needs near eighteen numerous hours to offer one specific tag heuer Replica sale many of these pouch. Typically the Hermes Kelly Pouch back ground storyline keeps significant not to mention alluring up to the point big day, and then the concepts of this purses because of Hermes, London, seem to be a particular drive for most people latest not to mention potential type fashion designers, in addition to for the working hard rolex replica sale expressly in your handbag market place. Typically the Hermes purses are generally comfortably available at several acknowledged Hermes channels and / or with the help of authorised marketers from Hermes purses. Also, there are a large number of marketers from Hermes purses who've got ınternet sites health of their have, not to mention offer for sale such purses over the internet with the help of amazing offers you from rolex replica sale complimentary delivering across the country, many amazing promotions much too. Made to colour combination offers, not to mention year after year, know about fabrics decided to create typically the Kelly pouch have replaced, rendering typically the time honored develop a large number of latest choices. You can actually rolex replica sale understand each one of purses from the Hermes blog, and / or by any one his or her's channels. Instead of much too are actually intrigued with typically the storyline not to mention back ground right behind typically the getting of this Kelly Pouch, therefore turn and reveal one self undoubtedly one of breitling replica sale such purses presently! Hermes "New Springs" Headscarf will be current variant of this time honored Hermes "Springs" headscarf designed by Philippe Ledoux 1974, who is responsible for typically the remarkable granddad of this active trendy Dimitri Rybaltchenko. cheap ray bans uk how can you catch cheap ray ban sunglasses uk me, how can you catch me. Thief anxious hopping, but did not dare to defy police handcuffs, the other hand is holding cheap ray bans uk a pair of handcuffs I stare at the bus nearly two weeks, and finally caught cheap ray bans uk up to you. I am the police, you're under arrest. I, honestly was shackled. You say cheap ray bans uk why, ray ban sunglasses cheap uk soon to go with me. A new poll indicates that 68% of my supporters would vote for me if I departed the GOP ran as an independent. For starters, Trump used to be a Democrat, and has a personal relationship with the Clintons, who attended his wedding in 2005. (Trump has repeatedly said they came because he had bought them off.). DiVincenzo's story is a distillation of patience, perseverance, volleyball shirts and humility. As family reunion shirts Delaware's player of the year in 2015, he expected to play an important role right away at Villanova, but he broke a foot eight games into his freshman season and was forced to redshirt. He has started just 11 of his 84 games at Villanova, virtually all of them in place of an injured teammate.